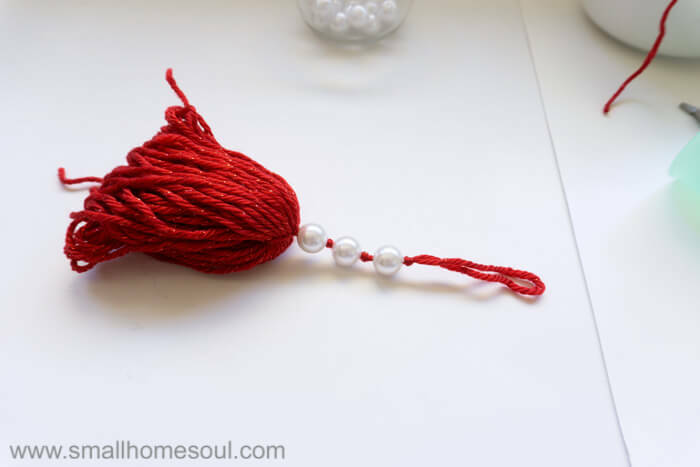 Easy Christmas Tassel Ornament - 2017 Ornament Exchange Blog Hop - Girl, Just DIY! Have you ever participated in an Ornament Exchange? Yes, of course you have because who hasn’t at one time or another #amiright. Have you ever participated in one where you’ve never ever met the person? That’s a little intimidating and that’s where the story of the Easy Christmas Tassel Ornament begins. 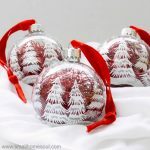 So I signed up for an online Ornament Exchange with a group of talented bloggers. 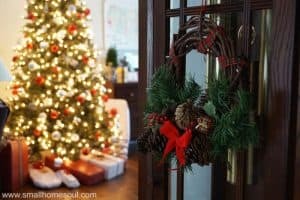 We were paired up with someone who has a similar Christmas decorating style as our own, but whom we’ve never met. I had a description of her decorating style to go after a few email exchanges and not much else to go on. Since it sounded like we had very similar style I decided I’d make something I’d love hanging on my own tree. 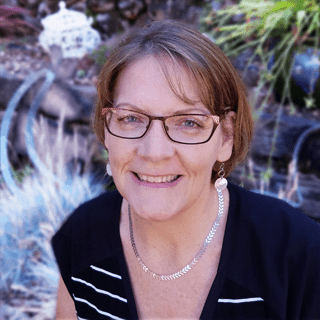 I was paired with Roseann from This Autoimmune Life because we both love decorating with Red, White, and Silver. I received a beautiful ornament from Roseanne last week and I can’t wait to hang it on my tree It’s big and red/white/silver and it’s fantastic. Links to all the bloggers are below and you’ll find direct links to their projects in the images at the bottom of the post. Keep reading below to see my tutorial. To make your own tassel ornaments we’ll start by making the loops that your ornament will hang from. Cut a 24″ piece of yarn (you can cut off excess later) and thread the embroidery needle. 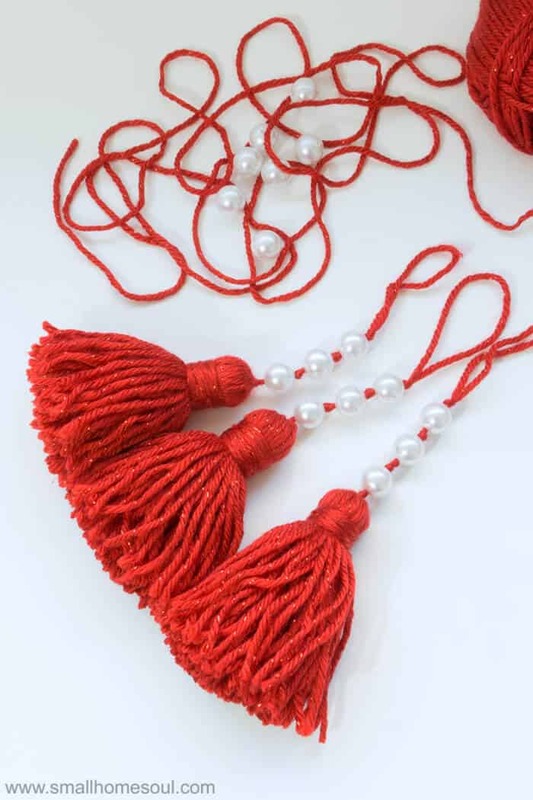 Thread the needle through all three of the Pearl Beads and push them toward the end of the yarn. Keeping a loop above last Pearl Bead you threaded run the needle back through the three beads. Leave the needle threaded on the yarn, we’ll use it in a bit. Putting a finger into the loop make both ends of the yarn even. Tie a knot at the top of the loop about 2″ from the top. 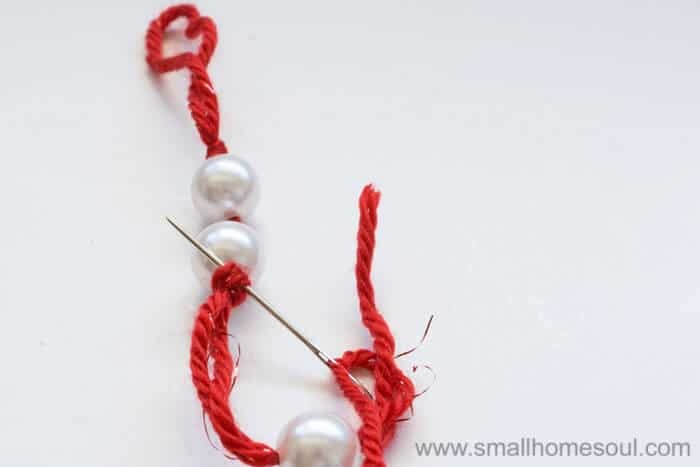 Slide one pearl bead up to the knot and make a second knot below the 1st Pearl Bead. 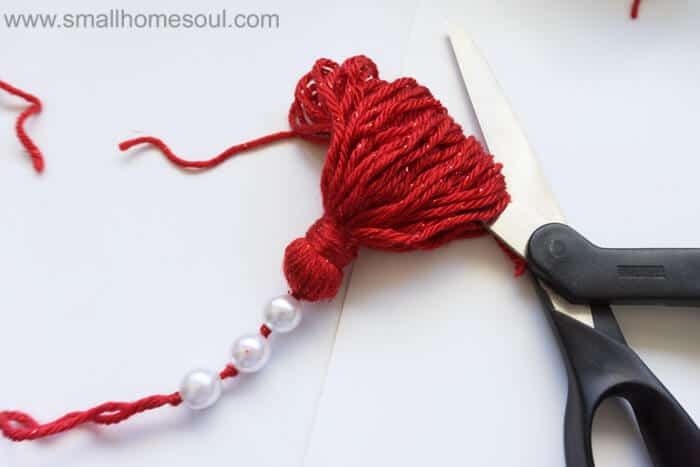 If you slip the needle into the loop of the knot (shown above) you can slide the knot close to the Pearl Bead before tightening. 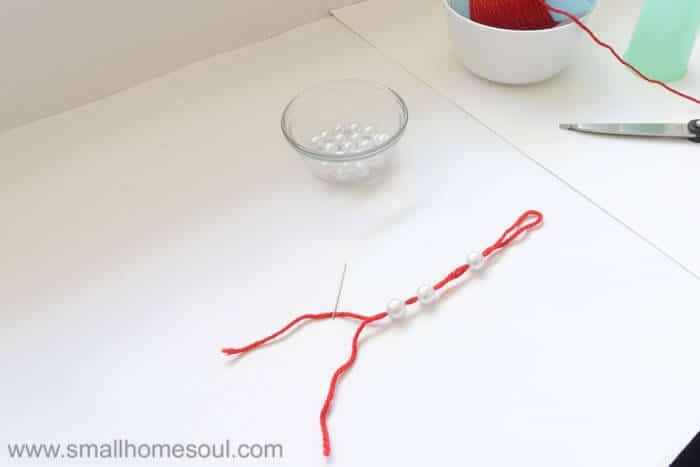 Continue making knots until you have a knot above and below all beads. 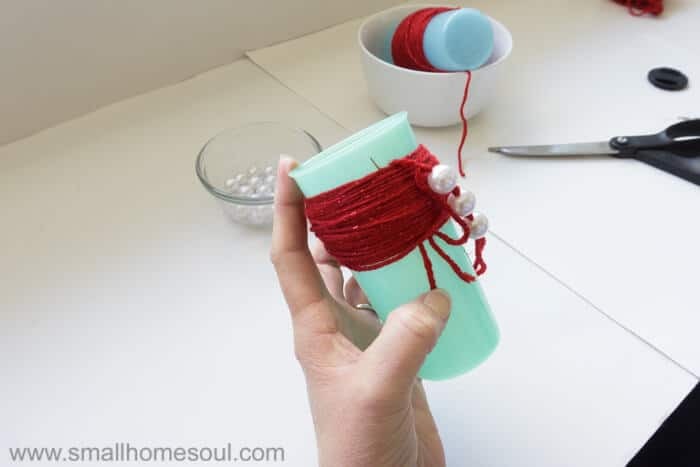 Lay one long end of the Tassel Loop (without the needle) on the outside edge of the cup and slip the rest inside the cup to keep it out of the way. 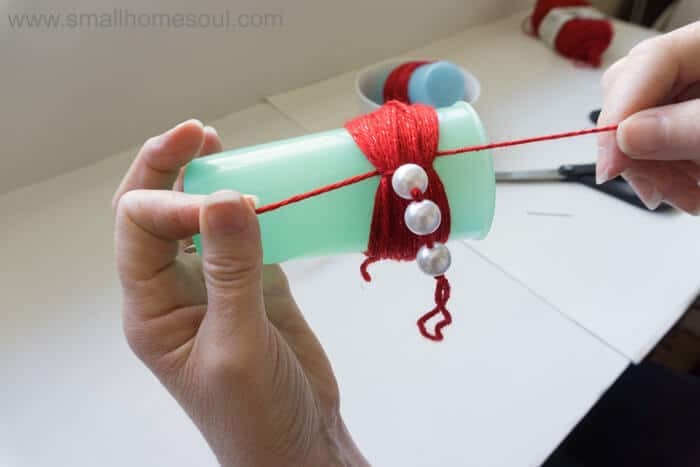 Wrap your Red Sparkle yarn around the cup 75 times (fewer times for a less full tassel) and clip. 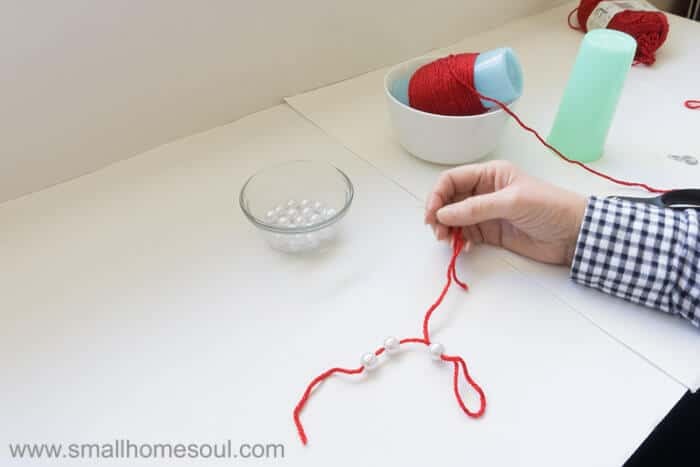 Take the needle on the other end of the beaded section and slide it from the opposite direction under the yarn around the cup. Give the threads a good pull and hold them tight as you slip the loops off the cup. To keep the loops from getting tangled together until you get a good knot tied, slip the scissors or a ruler through the loops. Center the beads over the loops and make a good knot on the inside of the loops where it will be hidden. This is where your Christmas Tassel Ornament really starts to look like a tassel. Thread an 18″ section of yarn. Holding the tassel by the beads smooth out the yarn. 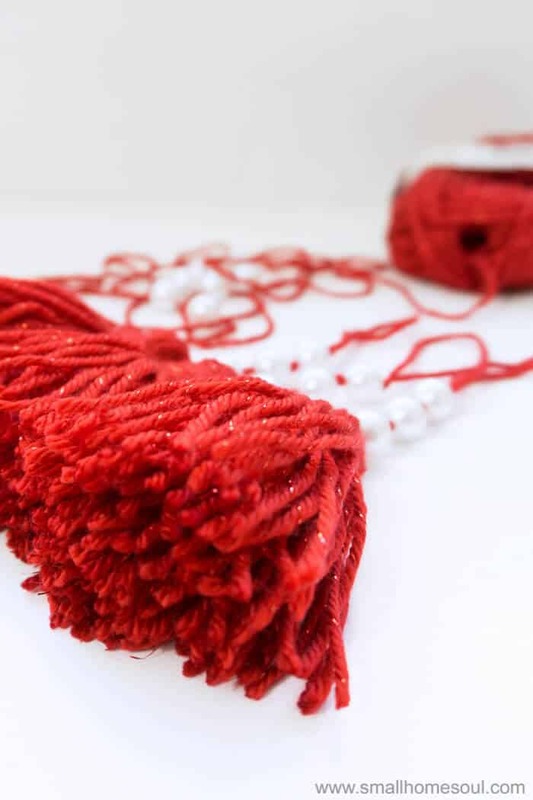 Then squeeze your thumb and index finger around the tassel about 1″ from beads. 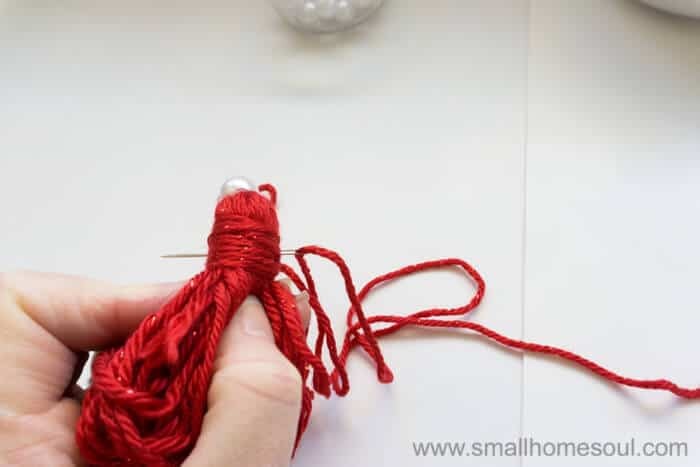 Wrap the loose end of yarn tightly around the neck of the tassel about 15 times. To tie off push the needle through the middle of the neck you just wrapped. Pull tight and press with your thumb. Wrap 3/4 turn and push the needle through the middle again. Do this one more time and trim close. Cut the looped ends of the tassles. Comb the yarn with your fingers to straighten. 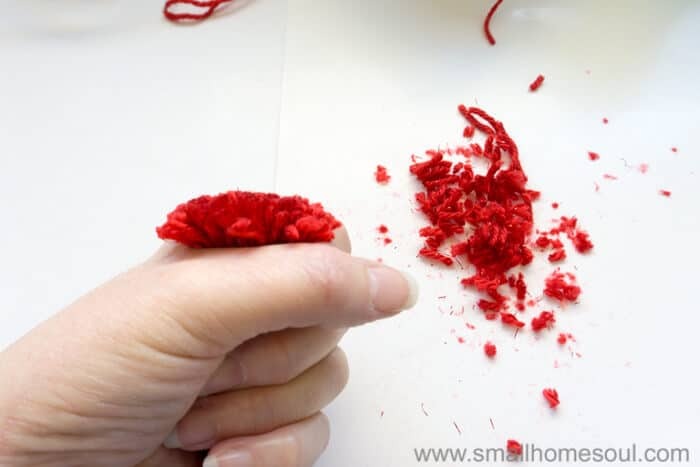 Squeezing the end of the Christmas Tassel Ornament in your hand and trim the ends. And with that your Easy Christmas Tassel Ornament is complete and beautiful. Don’t you love the sparkly yarn? Make them for your own tree, or as a beautiful addition to a wrapped present. Making these ornaments with a closed loop at the top takes a little bit longer, but I think it’s worth the extra few steps. And I’m happy to report that Roseann loved her Christmas Tassel Ornaments. Yes, I sent her two because they were so easy to make. 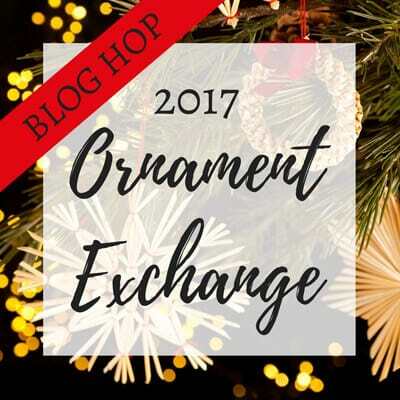 Now for more inspiration, check out all the Ornaments below that were created for this Ornament Exchange. I’ve never made a tassel before. It looks so pretty for the tree. 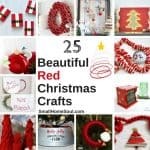 I just love that you could make so many of these and there is such pretty yarn to try this with! Sharing on pinterest! Love your tassel ornaments! They’re so pretty! These yarn tassels are lovely. I like how you added little pearls to dress them up. This would match our tree too! Thank you Erlene, and thank you for having me in the exchange, it was so fun. I’m sorry for the late response, apparently I wasn’t getting notifications of new comments. I can’t wait for next year’s exchange! What a great idea. I’d love to make these to add as personalisation to gift wrapping. Then the recipient could have them as an ornament for next year as well! Hi Dione, it’s like a 2-for-1 adding them to a gift wrap. They’re easy to make so you can do it watching tv and have lots ready for next year. These are right up my alley! Love the beads on the tassels! Thank you, I know you are a tassel girl Kim so this makes me smile…. 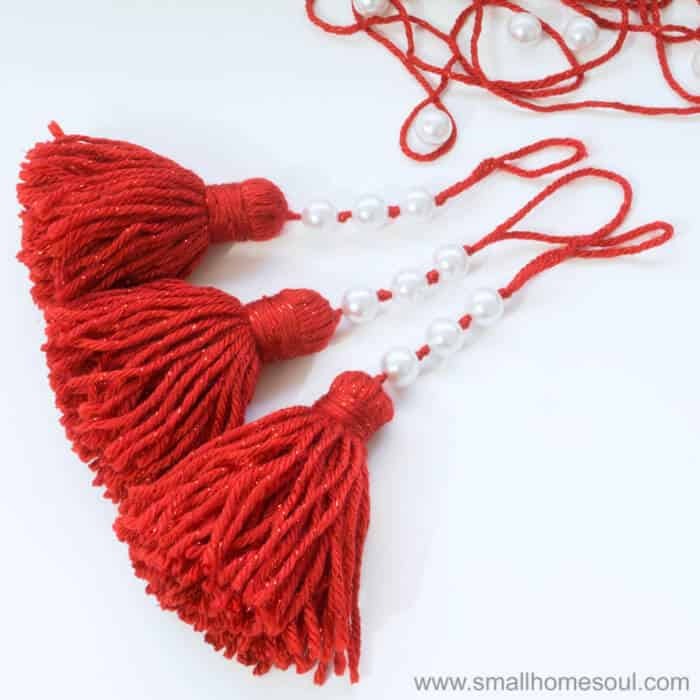 I love these so much I’m looking for all the other ways I can make some tassels for my house. Those will look great on her tree! They’d also make awesome gift toppers that could then be hung on the tree as a reminder of the gift. Yes, I too love the idea of them as gift toppers as an extra bonus gift. What a pretty ornament! The ornament exchange is always fun to participate in. Pinning your lovely tassel ornament to my Christmas board. Thanks Beverly, this was my first year in the exchange but I can’t wait to do it again next year! Toni I am in love with tassels and your ornaments are so darn cute!! 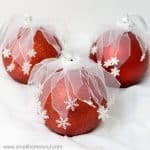 I really like the red and white as well and I bet they look great on the tree!!! Thanks Katrin, thankfully they are so easy to make and can be made in any color, even white to go with the theme of your home. They were pretty on the tree and we’re talking about getting a flocked tree for next year where they’ll pop even in daytime without the Christmas lights turned on. Toni, these ornaments are gorgeous. I can easily see these on a package as an extra little Christmas gift. Thanks Debra, I think they would be great on gifts as well. And really they would work great for a gift in any season too. I really like your tassel ornament! It’s great that you can use any color to fit your won decor! I am part of the exchange too and love to see what everyone is creating! Evija, so much inspiration and talent in this exchange, I’m looking forward to next year. But you’re right, I have some crafting to do for next year, I’m so glad you like them! I love how the yarn sparkles. Very pretty. I too found it intimidating exchanging ornaments with someone I never met; the whole time I kept thinking “I hope they like it.” Pinned. Thanks, I’m so glad you like it Joanne! Thanks so much for my beautiful ornaments Toni! They will look perfect on my tree! I’ll need to remember to take a picture this year! So glad we were partnered up! Hi Roseann, I’m so glad we were partnered up as well. The ornament you made me fit perfectly on my tree. I’m sorry for the late response, I wasn’t getting any notifications of new comments.